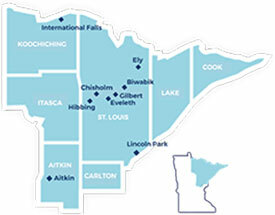 The Northland Foundation recently was awarded $686,500 by U.S. Department of Treasury Community Development Financial Institutions Fund (CDFI Fund) for lending in Aitkin, Biwabik, Chisholm, Ely, Eveleth, Gilbert, Hibbing, International Falls, and Duluth's Lincoln Park neighborhood, and the surrounding census tracts. Loan funding is available for start-ups as well as expansions of existing businesses that are majority owned/operated by people of color, women, veterans, people with low incomes, or people with disabilities. Interest rates will be 2% to 4% for qualifying loans with bank involvement. Contact Michael Colclough or Alex Bastien at the Foundation for details. The Northland Foundation's Business Finance Program has closed four business loans totaling over $286,000. These investments will assist with the development of a crisis/respite care home in Ely for people with disabilities by a Babbitt-based organization, construction of a new child care establishment in Duluth's Lakeside neighborhood, and purchase and remodel of the former 4th Street Market in Duluth by a nonprofit, AICHO, to establish a coffee roaster and local foods shop. To learn more about the Business Finance Program and the tools available, please email Michael Colclough or Alex Bastien, or call the Northland Foundation at (218) 723-4040.